As a small business owner, you are the backbone of the US economy and should get the most from your small business tax deductions. As tax day rapidly approaches, millions of small business owners, independent consultants and 1099 employees around the country will be scrambling to find as many tax deductions as possible to ensure a better return or minimize taxes owed. They will seek out the expert guidance of their accountant and bookkeepers to ensure they file properly while uncovering as many nuggets of deductible gold as they can. 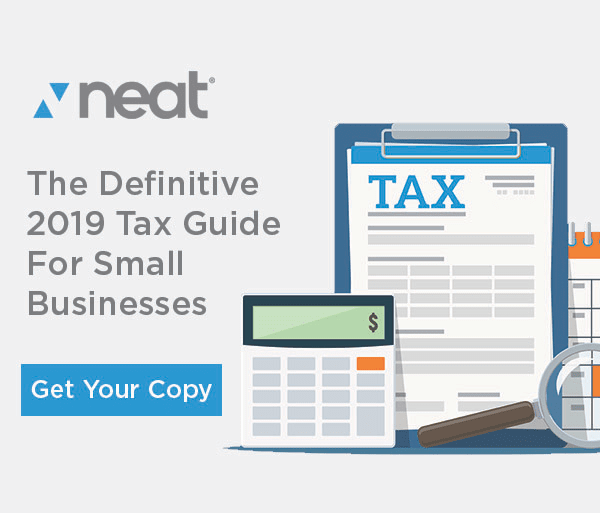 While regulations change with new administrations, there are some generally accepted deductions that every small business owner should be aware of. Businesses should be diligent in keeping detailed records throughout the year so when it comes time to file, the process is easier and costs less. Did you use a lawyer, consultant, advisor or any other professional business service (hint….accountants count) throughout the year? If so, keep an accurate record of those invoices! They are deductible. Every piece of software you buy and use, in any form, for the management of your business is deductible. This includes accounting apps like QuickBooks, web conferencing and word processing apps…even less obvious things like the software used to create your website (like WordPress or GoDaddy) or add-on products for Gmail. Also included are mobile apps like map and mileage tracking or receipt scanning apps like the one Neat includes in its software? Keep a detailed record of invoices or receipts from all software apps. No, this doesn’t mean you had to enroll in Harvard to get a deduction. Did you travel to a seminar? 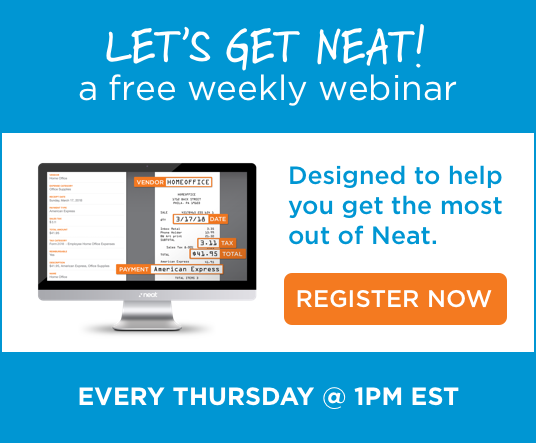 Pay to attend an online webinar? Did you attend any tradeshows? All of these events are considered education expenses so long as they pertain to your business and as long as they are 100% business related. Any expenses incurred as part of the event are tax deductible as well. Keep those receipts! Of course, any business cards or yellow page listings count, but what about social media? Did you pay for any premium accounts on Twitter, LinkedIn…etc? If so, that’s advertising! Work from home? Congrats! All those lovely utility bills you get each month for water, heat, trash removal, etc, count. File your bills away and don’t just guesstimate the amount you paid the entire year. Every penny counts. The only good thing about insurance premiums is they’re deductible when related to business. This includes credit, liability, malpractice, and workers’ compensation insurance, among others. About as popular as insurance premiums, but hey, at least we can deduct them. Yup! It may sound strange but taxes incurred in running your business are deductible. Did you have that cell phone or computer serviced? What about a copier or any work done on your home (assuming you’re in a home office)? Keep the bills and receipts as they all count. Keep every receipt. While petty cash purchases seem small and insignificant, they add up to substantial amounts throughout the year. This is where most people fall down in keeping good records. Having a mobile phone receipt scanning app like Neat’s is an invaluable tool as you can snap a pic and store all expenses in its cloud-based app. In an instant, it’s ready to send to your accountant or bookkeeper at year’s end. Don’t try to track of every receipt, bill, invoice or bill of lading by keeping a box full of receipts. Studies have shown that business owners and individuals who don’t keep regular track of expenses in an organized filing system (digital or traditional) can lose up to 20% of what is deductible each year. Are you willing to donate an additional 20% of your small business revenue to the government? Use apps like like Neat for tax prep and to capture all of your expenses in real time via phone, scanner, email, and upload. The system will keep a file and image of each expense well organized and safe and secure in the cloud.